The order Perissodactyla, also known as Odd-toed ungulate contains three families; horse, rhinoceros, and tapir. They are hoofed animals like all ungulates, but all three families share two other traits in common that distinguishes them as a group. They have a hoof with either one or three toes, and they are hindgut fermenters; that is, they digest plant cellulose in their intestines rather than stomach. Other than these characteristics, the Perissodactyl Families don't resemble each other at all. The Rhino is huge and can weight up to 6000 pounds. The tapir resembles an ant eater but because of its feet it can not be considered part of that group. 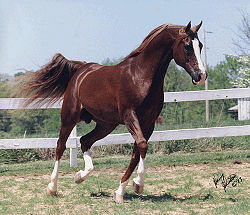 Then there is the horse which is the most domestic out of all of these. All Perissodactyls are herbivorous animals. Their teeth are massive, very strong, and are specialized for grinding foods such as plants. A rhino's skin has an almost armor plated look to it. Male rhinos weigh around 3000 pounds on average. The horn of a rhinoceros is made out of hair that does not have a bony core. The hair is compacted into a bony structure. The rhinos horn is not even attached to the skull. Some rhino's have 2 horns while others only have one. Their horn is 18 inches long on average. They use their horns when they fight other rhinos to defend their territory. Rhinos have poor eye sight but they make up for their sight with their hearing and smelling. They can move their ears and focus in on sounds making it so they can hear things much clearer. The Equids include three species donkey, zebra, and the horse. Equids are medium mammals, with long necks. They have tails that either end in a tuft, or are covered in flowing hair. The horse's body is made for fast running. Their limbs are long and slender which enables them to run for long distances. Because of their strength Equids can defend themselves by kicking their attacker. Perissodactyls are herbivorous. They eat what is available according to the region that they are located in. Tapirs like to live near water and usually can be found in tropical forests except for the mountain tapir that lives in the mountains. Tapirs eat leaves, twigs, fruit, and other vegetation. Horses prefer to live in grasslands while Wild Asses live in the desert. Horses eat bark, leaves, fruit, and roots but their favorite meal is grass. Horses spend 60-80% of every day just looking for food. Most Horses can go without water for around 3 days but zebras must drink water often or they will die of dehydration. This is an image of a White Rhino's horn. Hunters shoot rhinos for their horn, they think that a rhinos horn has special medicinal powers. The use of rhino horn has been illegal since 1993 but people still hunt the Rhinos. A Rhino's horn can sell from $ 21,000 to $ 54,000 for every 2 pounds. Because hunters kill rhinos for their horns the entire Rhinocerotidae family is being threatened by extinction. Less than 15% of the 1970 rhinos population is almost extinct. 90% of the black rhinos were killed leaving them very close to extinction as well. Even though rhinos are nearing extinction hunters still hunt them because all they want is the horn. This page was last modified on 26 July 2014, at 11:51.